Petites Midnight Frost-$1.79 Buys A Nice Polish! Above & Below: Petites brand in Midnight Frost. I used 2 coats, and it dried quickly. Below: With one coat of Essie's Matte About You. Above & Below: A comparison to Orly's Iron Butterfly shows that they are similar, but the Petites has much less glitter and the glitter itself is larger in the Petites. 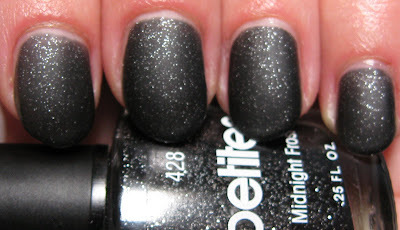 Today I have another bargain drugstore nail polish for you, this one is Petites brand in Midnight Frost. Petites are manufactured right here in my home state by Scherer, Inc. They also manufacture the Chameleon and CQ brands, often found along side the Petites. I picked mine up at Rite-Aid, and I believe they can also be found at many Walmart stores as well. Midnight Frost is a black creme base, filled with tiny silver glitter. I used 2 coats and it covered quite well. I kept picturing Orly's new matte polish in Iron Butterfly as I applied this, wondering how close this would look to the Orly if I applied a matte top coat. As you can see, it is somewhat similar. For $1.79, I think it was money well spent, because this is a very pretty black glitter polish. Ooo, I love that matte! It looks a bit like Orly Goth, which is also a black (creme or jelly- only have seen swatches but my own mini version is on its way :) ) with silver glitter in it. I have this Petite! These are so cute! I have some pastels from them tho and i wasn't impressed with those but this one was nice. Love this glittery polish. I really like this on you. Nice and glittery . I'll have to look for these. gildedangel~I do too, that's all I could think of when I was painting my nails is 'I have to matte this!'. Antonea~I have a creme from them that I had lots of chipping issues with, but this one seems much better. Lucy~they're cheap, which is nice! Some are better than others, but they definitely make some nice shades.